If you are like most business owners and managers, you are busy to the point that you do not give much consideration to something like sidewalk maintenance. Though sidewalks are somewhat of an afterthought and subtlety in the context of business, they are one of those details that matter a great deal to customers. Maintain the condition of your sidewalk and your business will prove that much more appealing to customers. Do not make the mistake of leaving your sidewalks “as is” for years or even decades on end. Though these spaces are often neglected, the look and condition of your sidewalks partially shape customer perception of your business. Thankfully, the concrete that comprises sidewalks is fairly low maintenance compared to other materials. Give your sidewalk some attention every now and then and you will ensure it looks its best while providing the most value for your investment. The last thing your business needs is dirty sidewalks that look dated, ugly, and uninviting. If your sidewalks have any dirt built upon them, they will make visitors think less of your business. Your sidewalks should be cleaned with regularity to eliminate dirt, gum, and other stains. Neglecting sidewalk maintenance will only cause a diminished appearance and sub-optimal condition. If you notice any cracks in your sidewalk, have them tended to by a professional pavement crack filling team right away. Professional concrete services ensure those diminutive cracks do not extend even farther and ruin your sidewalks. Keep in mind these cracks can form out of the blue, even if you have done nothing wrong in terms of sidewalk care. Wear and tear is natural for sidewalks and just about every surface. As long as you have your sidewalk cracks corrected as soon as they are visible, you will have done your part to prevent even larger cracks from forming that lead to damaging fissures. Even if you do not mind cracks forming in your sidewalk, the gradual wear and tear of these often-traveled portions of your property will likely lead to moisture seeping down below. If water intrudes below the surface of your sidewalk, it will weaken it as a whole. 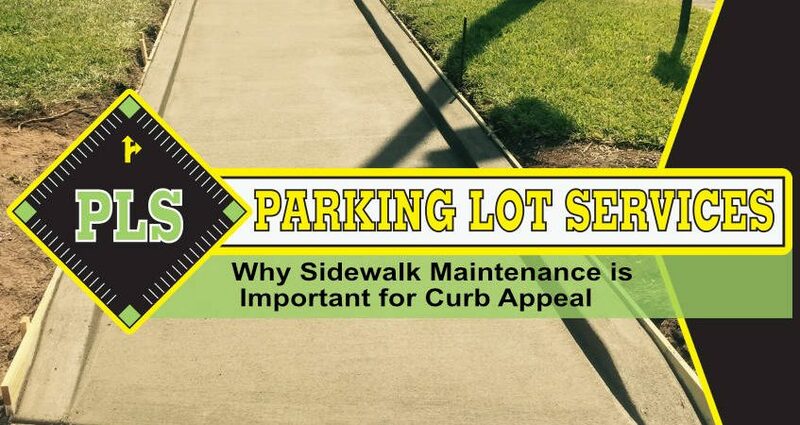 Regular sidewalk maintenance will tend to any such intrusions in a timely manner to prevent extensive damage that chews up your time and money. Sidewalks function in tandem with concrete curbing. The two are typically positioned near one another and help protect the property against damage. Curbs are essential to water runoff. Water moves along the curb instead of the sidewalk, eventually reaching the storm drain. We have your sidewalk maintenance needs covered. Our sidewalk maintenance team is here to handle all of your sidewalk and curbing needs to keep your property in perfect shape. Whether you haven’t had sidewalk maintenance performed in a while or are interested in other parking lot services, PLS can help. Reach out to us at (813) 880-9100 to learn more about sidewalk maintenance and our other service and repair programs.